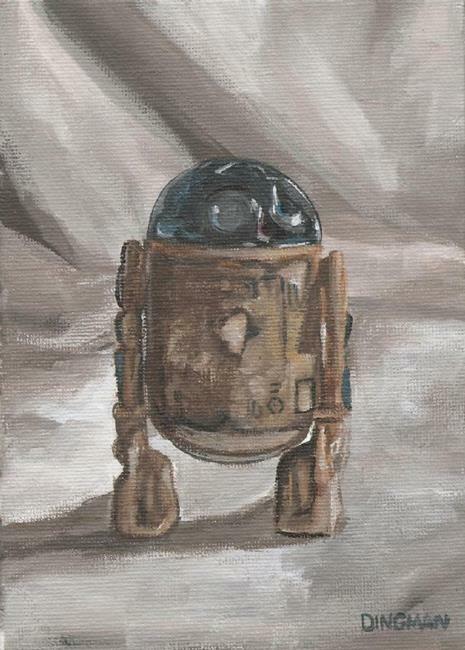 In trying to work out the best methods of painting worn-out action figures, I've started a sub-series of my regular toy paintings. This is my husband's R2-D2 figure from childhood. The sticker is worn off from being wet too many times; R2's normal white appearance is yellowed from being in a smoking home for his earliest years. Paint is scratched off everywhere. It is difficult to convey that kind of detail on such a small object, but I enjoyed this attempt and look forward to others!